The standard backup solutions include standby generators and UPS systems. IT is critical to ensure that the standby generators are not overloaded under all failure conditions. Additionally, the generator must perform properly under all failure modes harmonic distortions. The engineer must specify a generator with the appropriate level of subtransient reactance. Also, it is a good idea to specify a generator that is “mission critical” rated for a load factor of 85%. Time-tested, tried, and proven systems: standby diesel generators with closed-transition bypass isolation switches and static double-conversion on-line UPS with batteries. Paralleling gear is necessary when capacity or redundancy requires it, but I avoid generator paralleling gear unless necessary for capacity. It has become a single point of failure on some projects. In large mission critical facilities, a current trend among engineers is to specify medium-voltage generators because it is possible to obtain utility service at 15,000 V or higher—a significant benefit over the conventional 480- or 600-V systems. This has required larger but fewer feeders—therefore, less copper—with an associated cost savings. This is a successful, robust power strategy, but we have had to manage the increased risk of arc flash events and other medium-voltage safety practices and equipment to satisfy medium-voltage electrical commissioning and testing—often at full load. 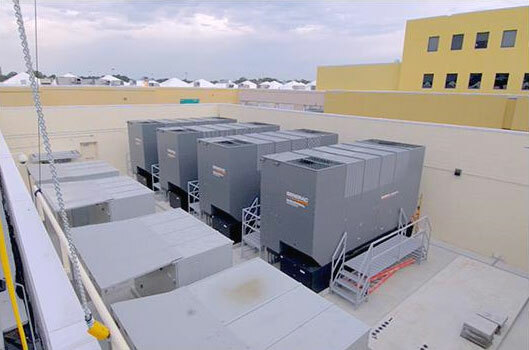 For more information on generators for data centers or mission critical facilities, contact South Shore Generator.